Richard de Clare, (1162 – December 30, 1218) was the son of Roger de Clare, 3rd Earl of Hertford and Maud de St. Hilary. He was was a descendant of Sveide the Viking. On the death of his father in 1173 he became the 6th Earl of Clare and the 4th Earl of Hertford. He was born in Tonbridge Castle in Tonbridge, Kent. More commonly known as the Earl of Clare, he had the moiety of the Giffard estates from his ancestor Rohese. He was present at the coronation of King Richard I at Westminster, 3 Sep 1189, and King John on 27 May 1199. He was also present at the homeage of King William of Scotland at Lincoln. He married (ca. 1172) Amice Fitz William, Countess of Gloucester (ca. 1160-1220), second daughter of William Fitz Robert, 2nd Earl of Gloucester, and Hawise de Beaumont. He sided with the Barons against King John, even though he had previously sworn peace with the King at Northampton, and his castle of Tonbridge in Kent was taken. He played a leading part in the negotiations for Magna Carta, being one of the twenty five Barons appointed as guardians. On 9 Nov 1215, he was one of the commissioners on the part of the Barons to negotiate the peace with the King. In 1215, his lands in counties Cambridge, Norfolk, Suffolk and Essex were granted to Robert de Betun. Soon after he signed the Magna Carta the king appealed to Pope Innocent III for help. The pope was concerned about this rebellion and decided to excommunicate the barons who had fought against their king. Richard de Clare and his son, Gilbert de Clare, 5th Earl of Hertford, were among the Barons excommunicated by the Pope in 1215. Sometime before 1198 Earl Richard and his wife Amice were ordered to separate by the Pope on grounds of consanguinity. They separated for a time because of this order but apparently they reconciled their marriage with the Pope later on. 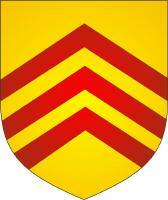 Richard de Clare's arms were: Or, three chevronels gules.